If you’ve got your eye out for a unique wedding gown, it’s time to think outside the box. The rhetoric of “the one” is applied to dresses as much as it is to people, suggesting that there’s one perfect dress for every bride, and a new dress ensures that it belongs to her and her alone. But buying a second-hand dress can mean getting more for your budget and still finding a gown that’s perfect for you. The selection at Urban Bride Delivered is diverse – sizes 00 to 28, priced from $150 for an informal dress to $1,200 for one that regularly retails for $7,000 – and the quality is high, as Powell only accepts designer dresses in current styles. 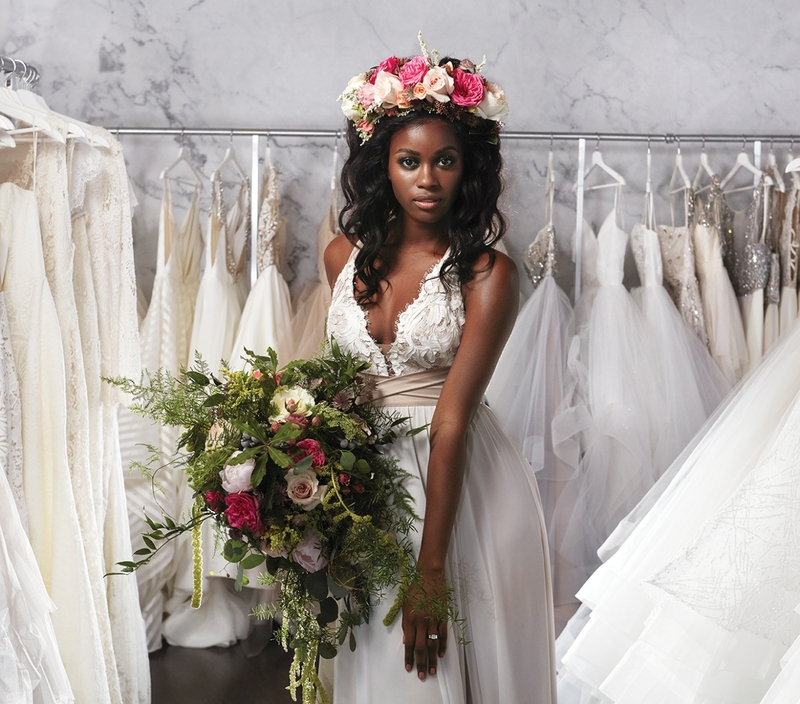 “When you open up a bridal magazine, you’ll see the same styles here,” she notes. Similarly, a sample sale at any bridal store can benefit brides who aren’t fussy about needing to wear dresses that they and they alone have worn. During a sample sale, off-the-rack samples of old stock and discontinued designs are heavily discounted. 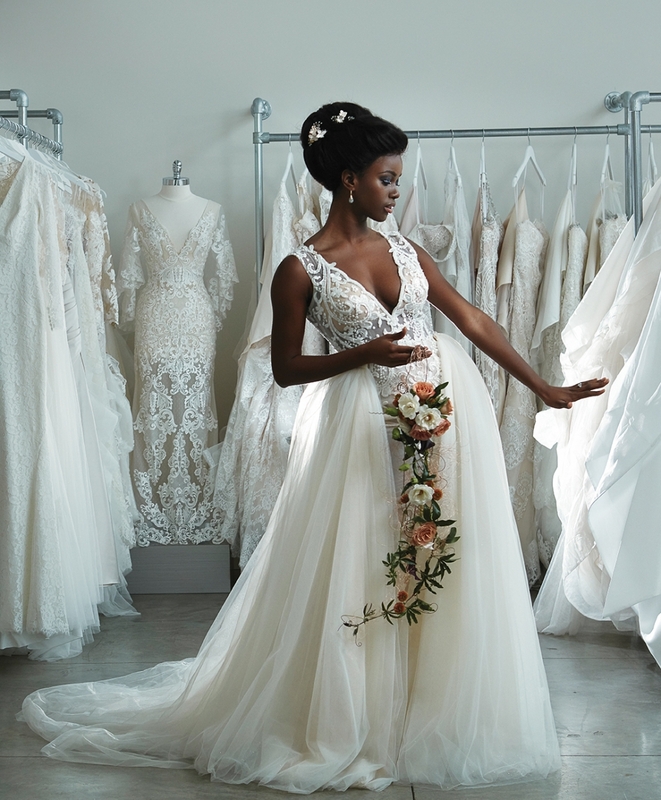 “It’s a great opportunity for a bride to snap up these high-end designer dresses at a price that can better fit within some budgets,” says Diana Gnac, manager of Novelle Bridal Shop. Some bridal boutiques, including Delica Bridal and Novelle Bridal Shop, offer designer trunk shows as ways for brides to find unique dresses. While a store might regularly just carry a few dresses from a designer, it will bring in the entire collection for a pop-up trunk show. 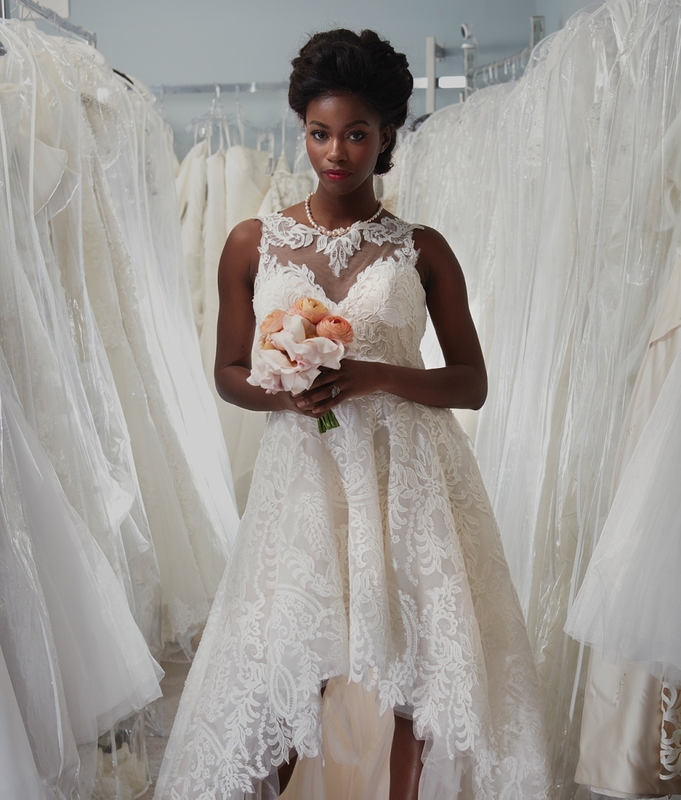 “It’s an opportunity to bring in all these amazing dresses to show our brides, and it’s for one weekend only so it creates a buzz and excitement around seeing these dresses,” Gnac says.”It gives us a chance to bring in unique dresses and offer something different to our brides.” In 2016, Novelle hosted an Anne Barge trunk show, and the dresses went over so well with brides that it now permanently, and exclusively in Edmonton, carries her Blue Willow collection. While it stocks designer dresses from Berta and Berta Muse year-round – and exclusively in Alberta – the trunk shows are an opportunity to shop for the latest and greatest styles every season, sometimes shortly following a stint on the runways of international fashion weeks. For 2018, understated, less intricate dresses have surged ahead in popularity over their flouncy, tulle-skirted counter- parts. “For the past couple seasons we’ve been seeing more of that boho [Bohemian] influence, everything’s kind of more flowy and slinky and romantic,” Gnac says. At Delica Bridal, owners Ashley McNeill-Dorado and Nicole McNeill love the simple dresses from Vancouver brand, Truvelle, that feature loose skirts, thin straps and uncomplicated bodices. “[Designer] Gaby Bayona brings a refreshing mindset to the bridal industry,” McNeill says. “Her dresses are very feminine, very simple, very minimalist.” And, selecting a more simple dress ensures that it has longevity in photos and won’t look dated too quickly. “A lot of designers are doing that cold shoulder look, and that’s definitely something you’ll be able to tell came from 2018,” Gnac says.